During the government shutdown of January 2019, I had some time to conduct a comics purge, going through my long boxes to decide what I wanted to keep, and what I knew I could toss out, satisfied that all I ever really needed from them was the memory of having read them. And then there were those that called out for one more read-through before being consigned to the dustbin. 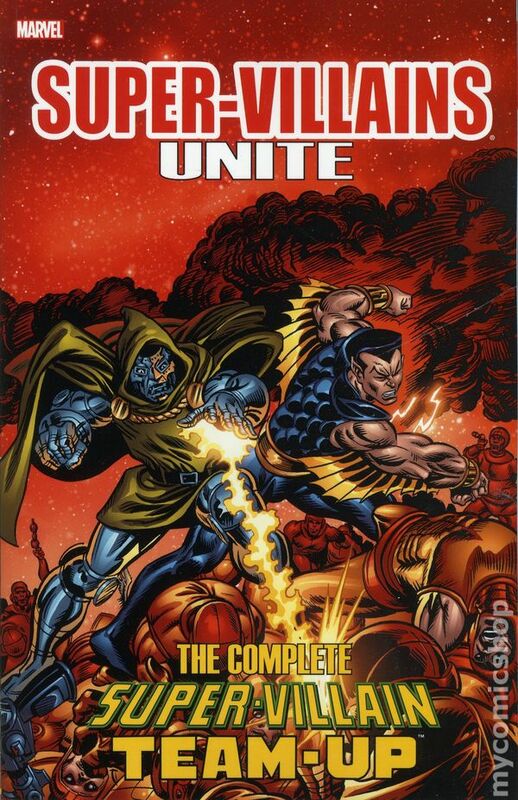 Among those runs was the complete Super-Villain Team-Up (initially, Giant-Size Super-Villain Team-Up). Back in 1975, I was a sucker for the team-up books, indoctrinated by the king of them all, DC’s The Brave and the Bold, and I read most of B&B’s comic book peers—World’s Finest, Marvel Team-Up, Marvel Two-In-One, Giant-Size Spider-Man, even the abruptly-cancelled Western Team-Up. The concept caught my interest, and thus I was on board for its full run. It’s one of the curiosities of the era, and to be honest, maybe it’s not worth revisiting. But I’ve got the itch to contribute to the series review threads around here, so let’s take a closer look, shall we? 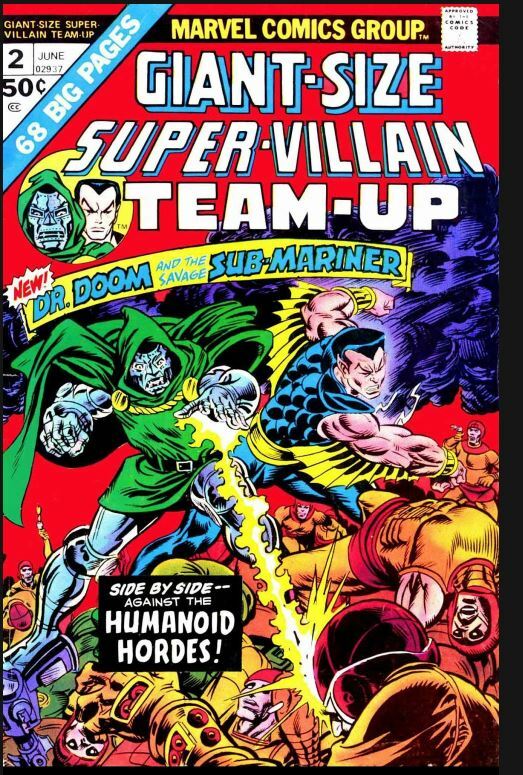 For those who missed out, Marvel has, rather improbably, collected this run (along with Doom’s earlier solo stories and some ancillary comics) in Essential Super-Villain Team-Up, a black and white newsprint volume. Currently out of print, it might prove easier to obtain than the originals…or maybe it’s the other way around. S-V T-U never featured any highly-sought character debuts, or art from any collectible super-stars of the medium. It is, admittedly rightfully, an easily-neglected series. A neglect which, appropriate or not, ends here. In a framing story, we see the previously-untold answer as to how Doom survived an explosion in space in Fantastic Four #144 only to return in #155: Namor rescued him after his armor protected him during re-entry. Namor, whose city of Atlantis is mostly comatose due to events in his recently-cancelled series proposes an alliance. Despite Doom’s previous betrayals, Namor argues that the pair could at a minimum conquer the cities near the oceans, and Doom finds the prospect of commanding New York, Los Angeles, London, and Japan enticing. Still, the proposal leads him to reminisce about his first one-on-one battle with Namor, and his ill-fated forced alliance with the villainous alchemist, El Diablo. 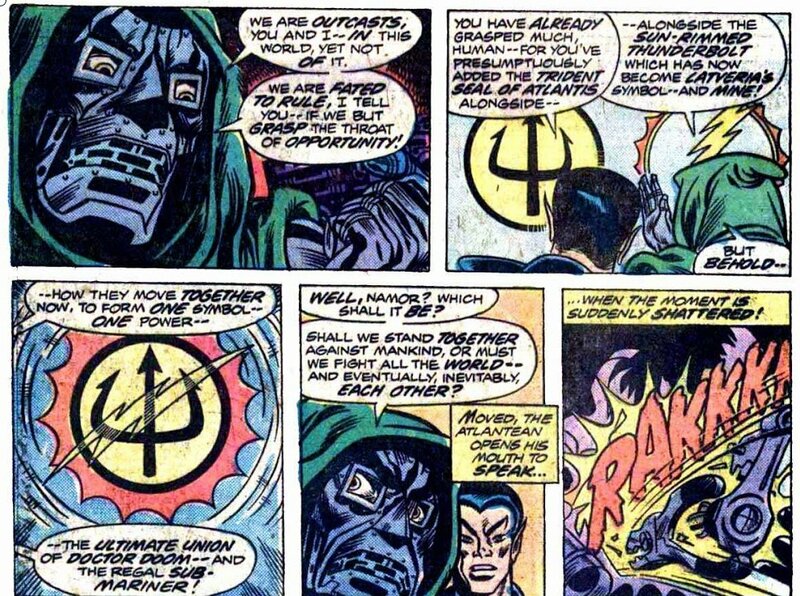 Doom rejects the proposal, and after a very brief battle with Namor, retreats, operating at a disadvantage due to damage from his meteoric descent from space. Namor remains confident that Doom will eventually reassess the idea and that their alliance is inevitable. The cover, by Ron Wilson and Frank Giacoia, is awkward, unappealing, and makes poor use of the sometimes enticing blurb overloading we often saw at the House of Ideas. We’re stuck with the “Giant-Size” branding in the logo, which I never objected to, but the “Super-Villain Team-Up” part of the logo was weak. I’d have advised following the Brave & Bold template, with the leads’ individual logos paired beneath a smaller formal title banner; both characters had strong logos with distinct appeal that this bland logo sorely lacked. Congrats on setting the record for hyphen usage in a comic book title, though! From Sub-Mariner #20 comes the title’s conceptual ancestor, Doom’s first guest-starring appearance in Namor’s solo book, written and drawn by the framing story team of Thomas and Buscema, inked by EC legend Johnny Craig. 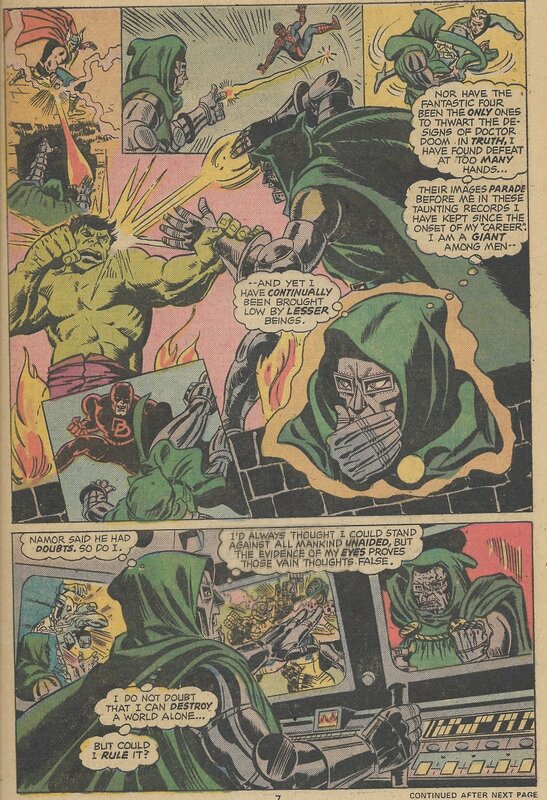 Then comes a reprint of Doom’s first solo outing, “This Man…This Demon” from Marvel Super-Heroes #20, by Thomas with art by Larry Lieber and Vince Colletta. Upon cancellation of Namor’s comic, readers were promised that he wouldn’t be homeless for long. It had taken a year, but in 1975, he found two new homes, this one and Giant-Size Invaders, which promised to tell his exploits during WW II. His fans may have balked at his portrayal as a “super-villain”, but his solo series, never one of Marvel’s most popular, had taken a turn in that direction prior to cancellation, and it was consistent, of course, with his earliest stories. This first issue doesn’t provide much hint at a direction, beyond assuring us of an alliance. In the text page, Roy offers a promise of both new and old heroes villains and heroes, and asks whether the focus should be on FF characters or a broader spectrum. One would think that the direction would be firmly established before beginning publishing, but the first few issues will provide little evidence of that. M. W. Gallaher, I love that you always are "logo-aware" in your reviews and comments. Marvel's tended to be dull and, especially around this time, generic and indistinctive. Makes the work of Ira Schnapp shine ever brighter. PS: Also love that you never forget to give B and B some love. Hm, I was about to take umbrage at your rather disparaging assessments of the series, since I've always considered it one of those odd-ball pieces of the Marvel mosaic in the 1970s that I love so much, but I have to admit: I have the series in the aforementioned Essentials volume, and after my first read-through many years ago (I only had a few actual issues of the series way back in the day), I've never gone back and read it again. Rather, I've only occasionally pulled the book for reference purposes only. Heck, to counter your point about character debuts, I was all ready to point out the Shroud, but then remembered that he hardly set the world on fire, and STVU #5 has not appreciated in value like, say, Hulk #181. Overall, despite a few enjoyable stories here and there, I'd have to agree that it was a mostly mediocre series. However, I will say that I'm not sure why you say Marvel "rather improbably" reprinted this run in an Essentials phonebook. What's so improbable about it? Given that we live in a world in which Skull the Slayer got a handsome tpb reprint a few years ago, I'm actually surprised that STVU series only has a b&w reprint, and not a few color tpbs or even a Masterworks edition. I picked it up at a con in a 4/$20 trade blow out a dealer was running. Ha! Didn't even know about the color reprint, but it just goes to prove my point. I should have learned by now that in this market, very few reprints from the mainstream publishers are "improbable." I didn't know about the full-color reprint, either, so thanks for alerting us, mrp! 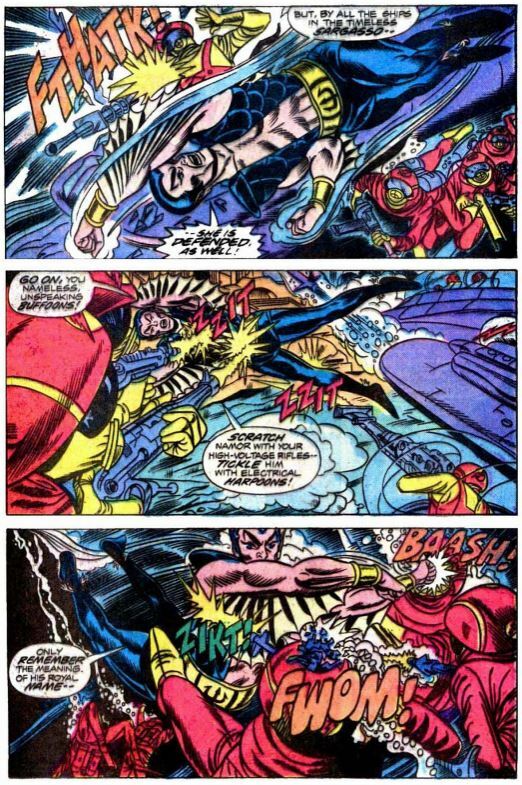 Namor, the Sub-Mariner, halts the oil tanker Typhoeus, whose Patagonian Navy crew fires on him in refusal to return to home port. 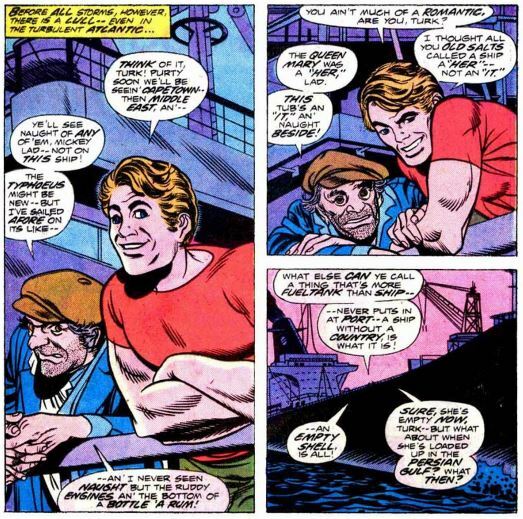 An older hand on board reminisces about seeing Namor attack a German U-boat in WWII, and convinces the hands to abandon ship, and the crew joins them after Namor sinks the “unsinkable” ship. Namor returns to nearby Atlantis, where, currently, the population is in suspended animation, unable to protect themselves, as a consequence of events in the then-recently cancelled Sub-Mariner series. But suddenly, the undersea city is shaken by an explosion, and Namor heads off to confront the unknown attacker. 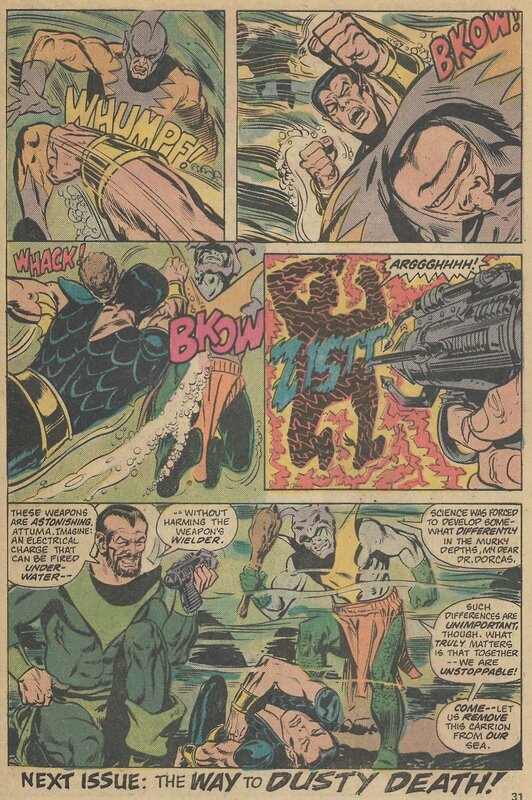 Namor finds Atlantis under siege by invaders in underwater fighter craft, firing “high-voltage rifles” which have little effect on him, as he attacks the “nameless, unspeaking buffoons” manning the vehicles. 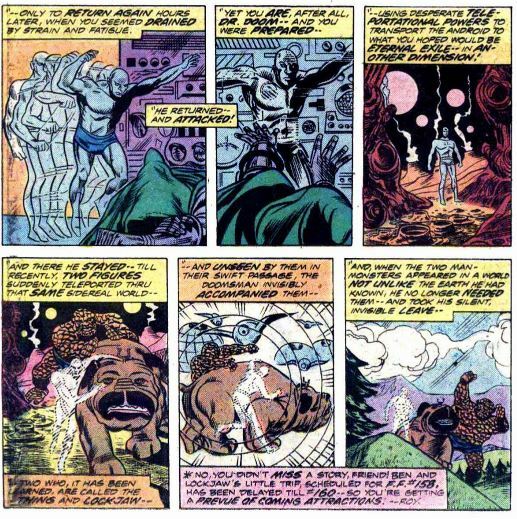 These are robots, and only one of them speaks, its facemask projecting the image of Dr. Doom, who has staged this attack to draw Namor out of hiding. 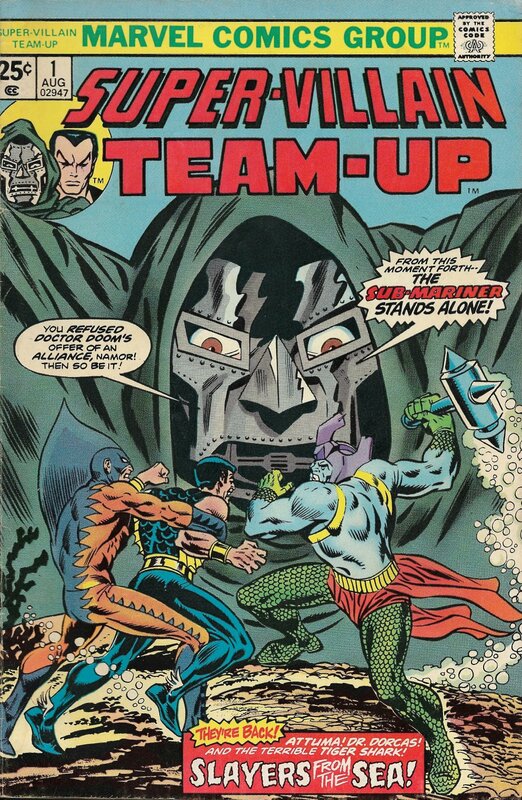 Namor surfaces to join Doom in a hovering craft, where Doom agrees to the partnership he refused in the first issue. With a veiled threat to reveal Atlantis’s helplessness to the vengeful surface world, Doom proposes a plan of world conquest, as the pair travels to Doom’s castle from which he rules Latveria. Doom’s castle is run by an army of androids, a pair of whom are ordered to fight to the “death” at Doom’s whim. Namor is disgusted by the display, but Doom doesn’t notice. He dismisses the androids’ curious practice of worshipping at altars dedicated to their fallen mates, and does not notice that the androids appear to express hatred of their creator. As Doom shows Namor the chamber in which the androids are created, hundreds of them outside are bowing to the strange altar, where a blue android appears, whom they give a special uniform. Doom defeats the android army by flooding the room; he had designed the androids to be “air-breathers”(?). Namor intends to destroy Andro, justifying his target’s death for Andro’s having used the androids like slaves (then wouldn’t Doom just as rightly deserve to die? ), but Doom insists on the sole right to finish off Andro. The two are evenly matched, and Andro teleports away, leaving Doom, Namor notes, to wonder when he will strike next. His android army destroyed, Doom reactivates his older, pure metal robot army, “immune” to Andro’s seductions…but a glint in a robotic eye in the final panel suggests that they, too, might have more of a soul than Doom suspects! For a 32-page story, this was pretty slim on plot. It did serve to set up the flimsy premise to launch the series: Doom and Namor declare an official alliance to rule the world. It sets up a potential recurring opponent in Andro, but accomplishes nothing else that a legitimate debut might be expected to establish, such as a supporting cast. It doesn’t kick off an ongoing storyline, but Marvel’s Giant-Size issues were (almost?) always self-contained (they may have been perceived to more often be “special purchases” than series followed issue-to-issue). This may have factored into Marvel’s conversion of the title to a regular-sized series, which, as we shall see, led to an awkward start. I don’t know that this series satisfied the readers left behind when Sub-Mariner was cancelled, but the issues to follow would do their best to pick up on Namor’s dangling plot threads. I’m sure some fans assumed this series would feature a rotating cast, as did the other “team-up” books on the stands contemporaneously, but this issue makes clear that this will be, for the foreseeable future, a Dr. Doom/Sub-Mariner book. Lieber wrote and pencilled the first half; Thomas wrote the second half, which Frank Giacoia pencilled. 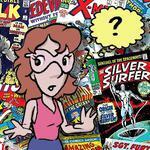 The Watcher did return as the host of What If? but I guess Marvel didn't have another sci-fi oriented anthology title for him to host besides that, and he would have seemed weird hosting anything else. They crossed some stories over with SVTU later to try and boost it but I didn't bother to get the one that tied into The Avengers, just the one which ties in with The Champions, but I'd probably buy anything with a Byrne cover or Magneto in it anyway (even though Magneto was a just plain evil bad guy a lot back then). Hooray! Team-Up books are my favorite! Contrarily, I like the team up to GSSVTU # 1. It gives you a good sense of what each character is about (water, castles, energy blasts, what more do you need) and communicates head-to-head visceral struggle quite well. It's a little reprint-y, but the whole comic was a solid package - Although it is annoying that this ish leaves out the cool-as-heck double page splash from the original Doc Doom story. Really pleased to see Super-Villian Team-Up getting a review thread, since I've always been intrigued by it, and doubly pleased that it's being helmed by the one and only M. W. Gallaher. Great critical insights and highly entertaining, readable writing on the two issues so far reviewed M.W. The "plot" of issue #2 does sound pretty flimsy, and I have to agree that the Mike Sekowsky artwork seems like a really bad fit for the series. In particular, those action panels you posted are pretty yuck! Anyway, nice review. Keep 'em coming! Doom and Namor get into an argument over who asked who to team up. Since neither wants to be seen as the one who needs the other most, Namor bails. Doom reviews his history of defeats, and has doubts about his ability to rule the world, before deciding they’ll inevitably team up. He sends a camera drone, disguised as a fish, to track Namor, anticipating coming to his aid when necessary. What is this, a rom-com? In three issues, we’ve had two breakups, with each of our leads getting the chance to pine away in certainty that the other will come to his senses. This is a strange little prelude, with Tuska handling art on the first 3 pages, Bill Everett barely identifiable as the penciler of the last 3. 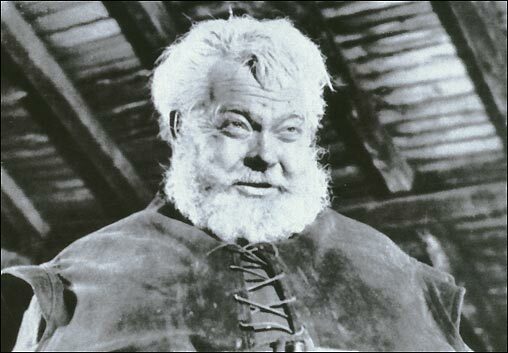 And wait, wasn’t Everett dead by this time? These pages, focusing on Dr. Doom, must have been leftovers from some unfinished project, but I can’t imagine what it was...part of an unused Dr. Doom solo story intended for Astonishing Tales? Oh, and despite the title, there are no “slayers from the sea” in this chapter. George Evans takes over the pencils, with Frank Springer on inks, the rest of the team is the same. 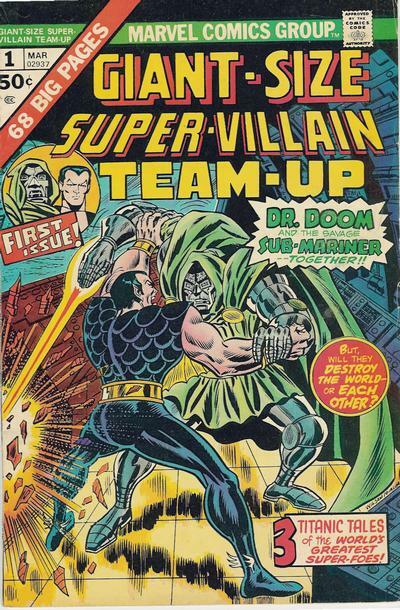 It says it on the cover: “the Sub-Mariner stands alone!” Not much of a “super-villain team-up”, with Doom making only a token appearance in the prelude. This story looks suspiciously like an unused issue of Sub-Mariner. Could this have been intended for Sub-Mariner #72, and been displaced by Steve Skeates’ standalone series finale? Seems possible—Isabella was working at Marvel back then. I know I kept buying this, so there must have been some appeal to the high concept of a Doom/Subby team-up, but looking back, I can’t see much reason why a typical reader would have signed on for another issue of this. It’s bland, and it doesn’t deliver on the promise of the book’s name. It's running almost entirely on cover appeal--and I've got to hand it to Ron Wilson, whose cover for this issue is a major improvement over his work on the Giant-Size first issue.